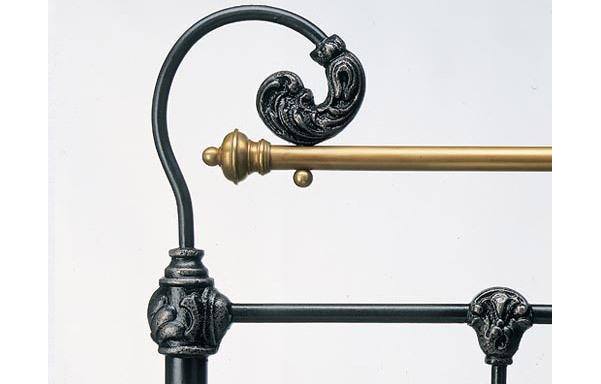 Forged iron scrolls, solid brass trim and decorative castings are made by hand much as they were a century ago. 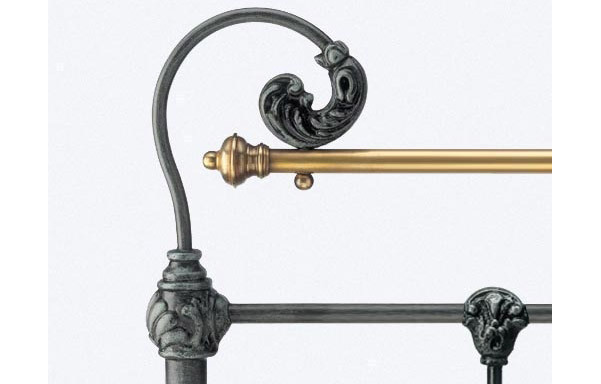 Available in three finishes. 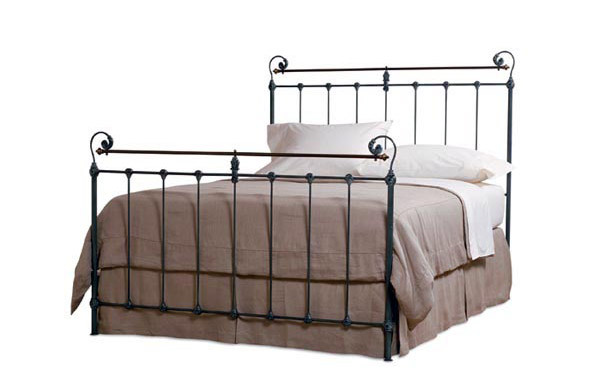 A classic iron bed! Review: "We recently upgraded to a king sized bed after decades of sleeping on full size mattresses. As we have a very large master bedroom this Hampton tall bed was the right scale for the room. Ordering the product was easy and delivery was quick - about 1 week (around the New Years holiday). The delivery people were outstanding. They arrived on-time and were very pleasant and respectful. We have a master bedroom on the second floor of the home and have a staircase that turns sharply. This king size tall headboard is VERY large and VERY heavy. I could never have moved it up the stairs myself but the delivery guys did it without doing any damage to the staircase or walls. The quality of the bed is excellent. As I said, it is very heavy so it is not flimsy in the least. I decided to put the bed together by myself. It took a couple of hours but everything was made to fit together very well. Hardware was all there and of good quality. The instructions were clear and easy to follow. In the end, the bed was super-stable - no wobbles in the headboard like our old bed. It looks great! The fabric is very nice and looks like it does online. Beautiful tufting. This is a quality item and I am very happy with it. I spent MANY hours researching this purchase and know I made the right choice for not only the bed but the mattress we bought at the same time." 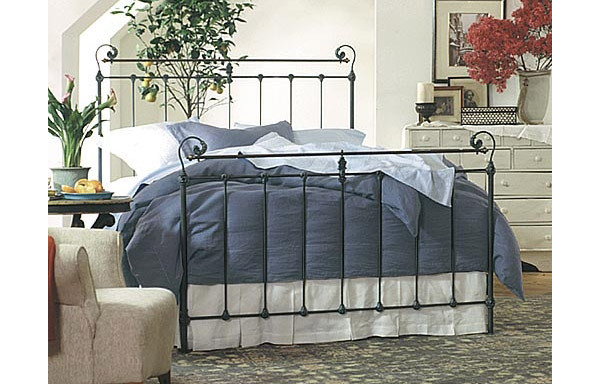 Review: "This is a very nice, high quality bed frame. I bought the california king model with the tall headboard. The headboard is extremely heavy and feels like very high quality. The bed frame is also super sturdy. I would definitely recommend. The only problem I had was with the directions. I had to go rogue in a couple spots because the pictures showed something that I couldn't do with the hardware I had. 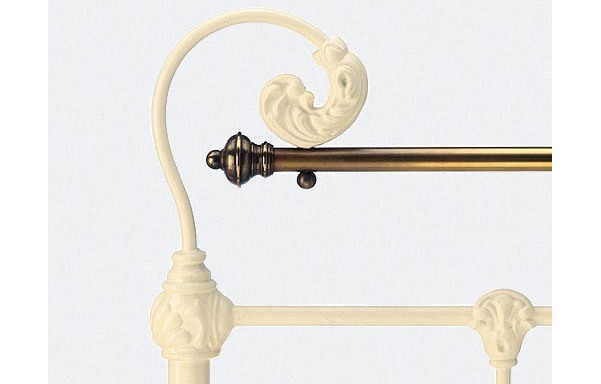 I had to go to lowes and spend a whole 82 cents on some nuts, but besides that, great bed frame. You are paying for quality here for sure."